Wes Anderson is one of those directors best described simply with a repetition of his name. Wes Anderson is Wes Anderson. His style embodies a mix of experimentation, minimalist dialog, aged, yet timeless design and a smooth, artistic, but completely self-aware fictional world. His expressively incomparable. And righteously strange. And the way that his films succeed so well at taking themselves seriously (Rushmore and The Royal Tenenbaums, specifically) while also embracing their inherent madness makes him the ideal director to tackle a work by renowned author and creator of strangeness, Roald Dahl. Dahl created worlds that were as out of place and timeless with words as Anderson has with images. And Dahl's focus on realistic characters appearing in absurd situations lends a nearly infinite amount of freedom to an animated film. I realize that I saw Fantastic Mr. Fox about 8 months too late. It has been around, floating in the NetFlix-ian ether for some time, and it only came to me via my friend Garrick who started talking it up so greatly that I couldn't imagine not watching it. And so, I did. The film follows a basic plot, the story of the titular Mr. Fox (George Clooney), his wife (Meryl Streep), and his son Ash (Jason Schwartzman), as Mr. Fox tries first to overcome his animal instincts to be a good father (by taking a job as a newspaper columnist) and then lapses into a mid-fox-life crisis. Mr. Fox, wants to do one more giant thieving job by stealing chickens, geese and cider from three local, cartoonish farmers. And from there springs the conflict. It's a very basic conflict, wrought with near misses, rescues and silly schemes (and a brilliant final teamwork-saves-the-day battle). If you're looking for twists or narrative complexity, look elsewhere, and/or check those expectations in the coat room. Fantastic Mr. Fox lives and dies by two things: voice-work and visuals. The stop-motion animation does an excellent job of making up for dragging spots in the plot, and really visually the film is a triumph. The unique characters dressed in suits of tweeds and plaids and excellent use of props (from "bandit masks" to motorcycles) comprises a world that is somewhere in the early '30s or '40s, but perhaps just quaintly country enough to be from present day. And the backgrounds are vivid, sparse and at a key moment, perfectly expansive. Voice work drives the film. Wes Anderson has always excelled at getting great readings of wild lines, and his stellar cast gets it done here. George Clooney charms his way through the over-confident title character. Meryl Streep is a timeless voice of reason in a somewhat underutilized role. But Jason Schwartzman, as Ash, is the icing. He mumbles and downplays his way through a character who is a lovable weirdo with dreams of being an athlete. Bill Murray, Eric Chase Anderson, Michael Gambon, Willem Defoe, Owen Wilson and Wallace Wolodarsky also star. The voice-work lends itself to a lot of, "who's voice is that?" moments. But the big undercurrent of the film is important to point out. 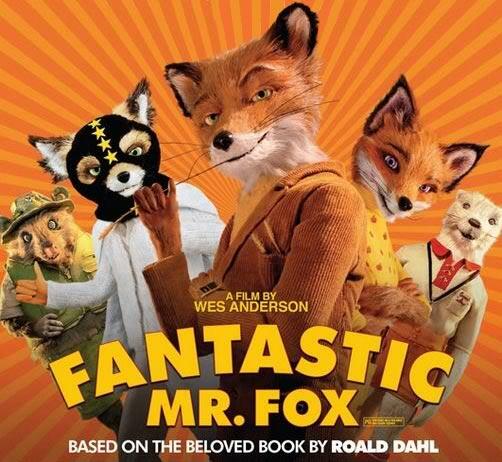 In Fantastic Mr. Fox, the animals are all personified. They wear suits (or parts of suits), walk upright and have human jobs, and human-looking homes, but they never completely loose themselves from their animal nature. Anderson keeps this mostly subtle, and sometimes plays it for humor with creative shot design. These characters eat at tables, for instance, with silverware beside their plates, but always end up devouring their food quickly, with hands, and as messily as possible. And arguments among the characters, too, boil over into animalistic biting and scratching fests. What we see is that no matter how far away we try to get from our nature, we can't dodge who we are. It's why Mr. Fox wants to steal chickens again, and it's why Ash wants to be athletic. These animals can't resign themselves completely to a modern life of "human" activities. The kicker, and this is a SPOILER, is at the end of the film, when Mr. Fox, who has professed a fear of wolfs, stops his motorcycle and looks off into a mountainous, snowy distance to see a wolf, on all-fours, standing atop a rock and observing them as they pass. Mr. Fox never says why he's afraid of wolves, but in that moment, as the title character looks out to an animal still so full of animalness, we understand a bit more about the film and its conflicts. It's a very Dahl-esque moral. The further we go into being a civilized society, the more often we will look out and wish we were free. All of these jobs and organizations and buildings and modern conveniences mean we are out of touch with nature, and sacrificing our personal freedoms for a greater good. When the wolf waves to Mr. Fox, showing that the distance between civilized and animal is incredibly small, it's a bit of a penance. We make our choice to be "human" knowing full well that the wild is not too far away should we want to grasp it. 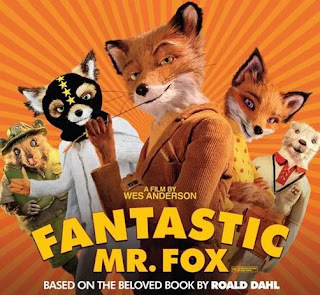 Fantastic Mr. Fox is a fun film, certainly not the most exhilarating or most excitingly plotted, but it tells a quiet, timeless story about deciding to grow up, even when we never actually feel like it. The style is unique and unmistakable, and there are nuances of story and character that make it memorable.